I love going out on food adventures. With a free weekend day I decided to check out a small food festival off Utica Avenue on the A/C line. Unfortunately due to crazy rain the festival appeared to be canceled. Disappointed but undeterred from eating awesome foods I followed the flow of human traffic up a few blocks. The area straddled a few nabes including Bed Stuy, Crown Heights, and Brownsville. Three neighborhoods almost totally unexplored by me. 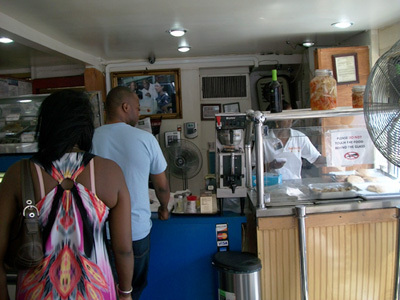 Conrad’s Bakery on the border of Bed-Stuyvesant is a small storefront located at 299 Utica Avenue. When I stopped by on a Saturday afternoon they were doing brisk business. They sell a variety of breads, rolls and cakes. There were two lines, a very short line for baked goods and a much longer line for something I couldn’t see. Curiosity kept me in the second line. As I got closer I could see the worker slicing open a round roll with a bread knife and adding a scoop of some type of filling. She explained that it was smoked red herring. The sandwich was $3.25. No lettuce, tomato, mayo etc, just a dollop of this mysterious herring mixture on bread and the smallest of smiles. It struck me as very no nonsense. 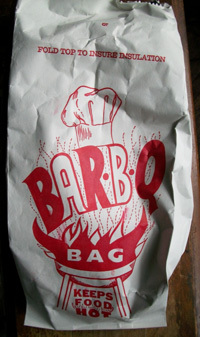 Still, all the regulars seemed to know this was the item to get and they gave it to me in one of those reflective, insulated bags I last saw at the Kentucky Fried Texaco in Chattanooga, Tennessee. The flavor did not disappoint. The herring is finely minced and mixed with tiny bits of scotch bonnet pepper, black pepper and garlic. The roll was sweet but not as much as Hawaiian Bread. 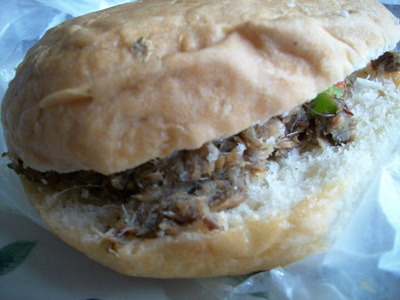 It’s very typical Jamaican Hardo but in roll form. The flavor paired beautifully with the red herring. To recap: Go where the locals go to. And if it’s in a steam bag, it will be twice as delicious. Must. Go. Get. Sandwich. Now. Conrad’s Bakery: Herring Sandwich – Jealous? 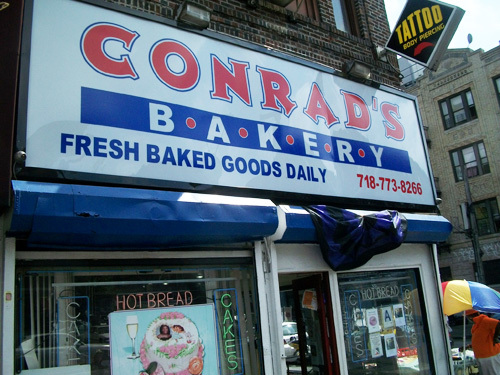 Conrad’s is worth the trip from South Slope. The next time I think next time I’ll check out the sweet breads. Since you’re local to the area are there any food places you’d recommend near there? Cheers and thanks for the comment. can you please give the recipe to make the same bread. Unfortunately I don’t have the recipe for the bread myself but found one that looks pretty close: http://www.food.com/recipe/jamaican-coco-bread-97040. Good luck!